Many times, infertile couples will be overly pessimistic about their situation to avoid getting their hopes up each time they get one step closer to pregnancy. This may be especially true for couples who have been through one or more miscarriages. While it may seem prudent to remind yourself of success rates and the possibility that you won’t get pregnant, this may be doing more harm than good. After all, in 2015 “the chance of having a live birth per ART cycle” ranged from 5.8 to 46 percent according to the Centers for Disease Control and Prevention, depending on factors like age, the source of the egg and whether the embryo was fresh or frozen. Those aren’t insignificant numbers! Allowing yourself to envision the possibility of a family can be a positive experience if you don’t shame yourself for your optimism. It’s my fault I can’t conceive. If I wasn’t so irresponsible with my health, I could get pregnant. I am letting my partner down. My body is a bad body. I am a failure as a man/woman. Maybe I’m just not meant to have kids. I will never have a child. If a friend or even a stranger shared these feelings with you, would you blame them for infertility or console them? Almost certainly the latter. Now consider this: what’s the difference between that friend or stranger and yourself? Next time you talk negatively to yourself, imagine you are saying the same thing to a friend, stranger or even yourself as a young child. It will be much harder to insult yourself and you might start thinking more positively as a result. At times, negative thoughts about infertility will surface suddenly. The key to positivity is stopping your negative thoughts before they affect your emotions. Redirect your attention to these thoughts by introducing a distraction. This could be a physical reminder, like gently snapping a hairband on your wrist, or a mental process, like grounding yourself by focusing your full attention on your five senses. Other tactics include letting your thoughts “float by” without dwelling on them or diving into another activity, such as a chore you’ve been putting off. That being said, it’s unnecessary (and often unhealthy) to repress your feelings in the long-term. Try setting these feelings aside for a private moment of reflection, perhaps when you’re taking a shower or bath, or a conversation with your partner. This way, you are still processing your emotions without letting them control your life. Work alongside a herbalist and naturopath. Herbs have amazing properties that support, nourish and heal. Exercise – Even a small amount of regular exercise, like walking, can improve your mood. Practicing mindfulness – Meditation and stress-reducing exercises like yoga and tai chi can help you let go of tension. Journaling – Writing down your feelings is an effective way to get worrying thoughts out of your head and onto paper. This exercise may make it easier to process and come to terms with confusing emotions. Psychotherapy – A mental health professional can help guide you through any negative emotions or mental health issues you may have and give you the tools to manage your mental health. Group therapy – Knowing others are going through the same struggle can help you feel less isolated and build your sense of community. .... & be kind to yourself! 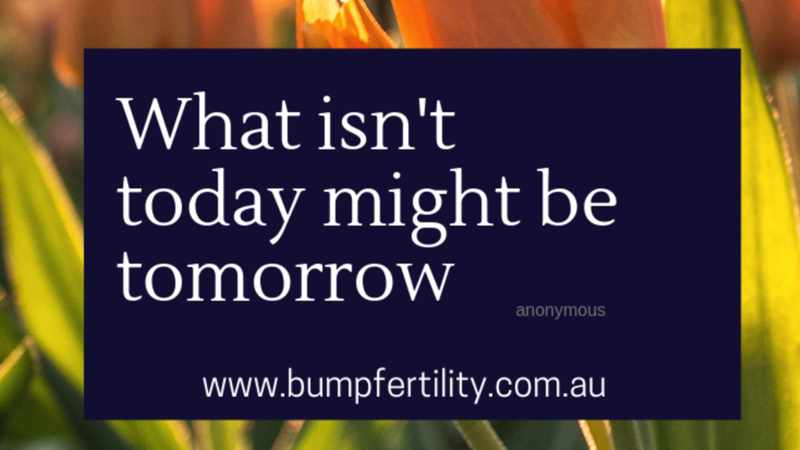 At BUMPFertility, we understand how difficult each person’s fertility journey can be. We also understand the importance of self-care and wellness is throughout the process. My BUMP Health Check assesses & manages infertility, addressing the ROOT CAUSE. Providing the foundation for producing high-quality eggs & sperm it also corrects hormone imbalance & restores fertility. This is why it works particularly well for those when IVF has failed.